An extra large family travel wallet to hold and protect your passports and other travel related documents in one single location. This would be a great accessory for keeping your family's travel documents safe, secure and handy while on holiday or at home. NOTE: Please leave me a message telling me how many passports you need to store in this wallet. This family size passport holder is ideal for families holding dual citizenship or larger families who need to carry multiple passports. Travel wallet is firm but pliable due to a special stabilizer used in between the layers of fabric to provide superb structure. ● Tickets, boarding passes, travel itinerary, insurance documents or folded papers. 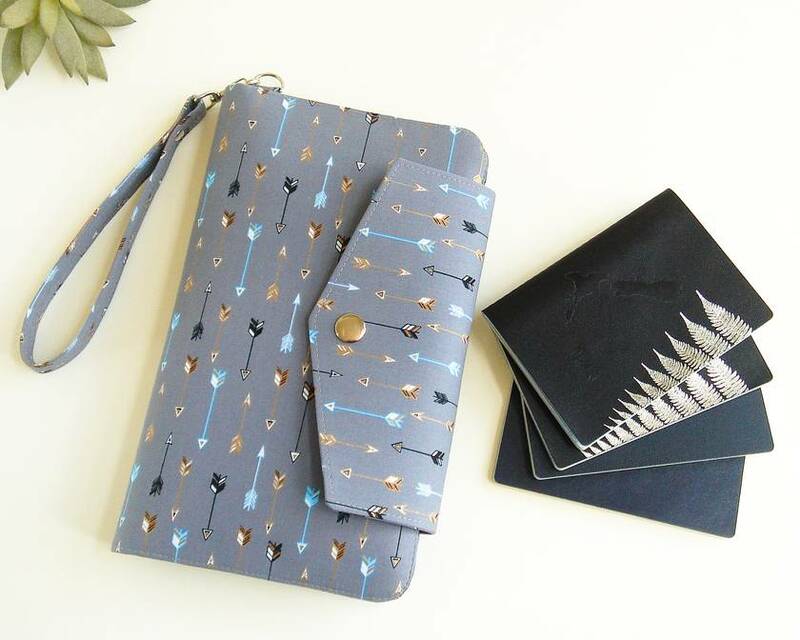 ● A small Moleskine Cahier Pocketbook. ● Two (2) designated pockets for passports capable of holding 4-8 passports. These pockets are constructed so that you can store your passports comfortably without putting any stress on the wallet. ● One slip pocket for holding folded documents, travel papers or boarding passes. ● Six (6) credit card slots capable of holding up to 12 cards (2 cards in each of the 6 slots). ● Slip pocket under the card slot section. Ideal for money or boarding passes. ● 7.75 inch (19.5 cm) fully lined zippered compartment for keys, money, coins and other valuables. This pocket is large enough to fit a passport. ● Large slip pocket for folded papers or 2 additional passports. ● Constructed with all pockets facing the middle of wallet preventing contents from falling out. 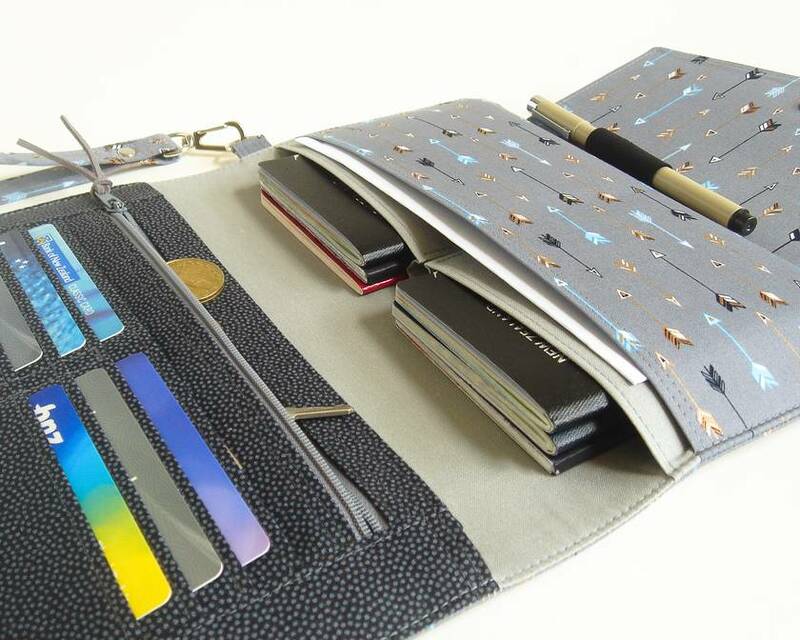 ● Large envelope style tab to keep travel wallet contents safe. ● Elastic loop for holding a pen. ● Metal snap button for the closure. ● Top stitching all around the perimeter to give a professionally finished look. ● Great structure, form and stability. Wallet will hold its shape even when empty. ● Detachable wrist strap to make for hands free travelling. 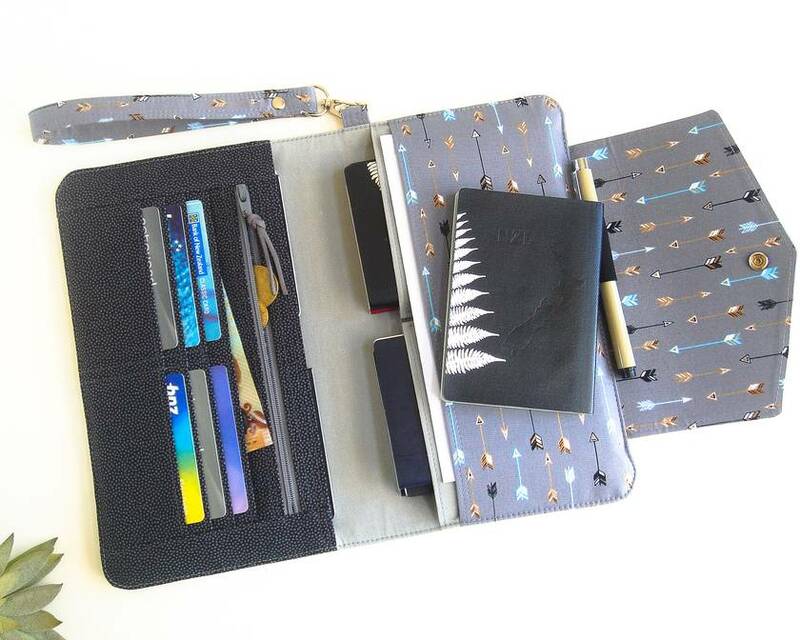 ● 100% cotton fabric with printed arrows on grey for the exterior and some interior pockets. ● Solid cotton in color of your choice for base lining and some pockets. ● Black polka dot fabric for credit card slots and zippered pocket. ● Metal snap button in silver. ● Metal swivel hook in silver. 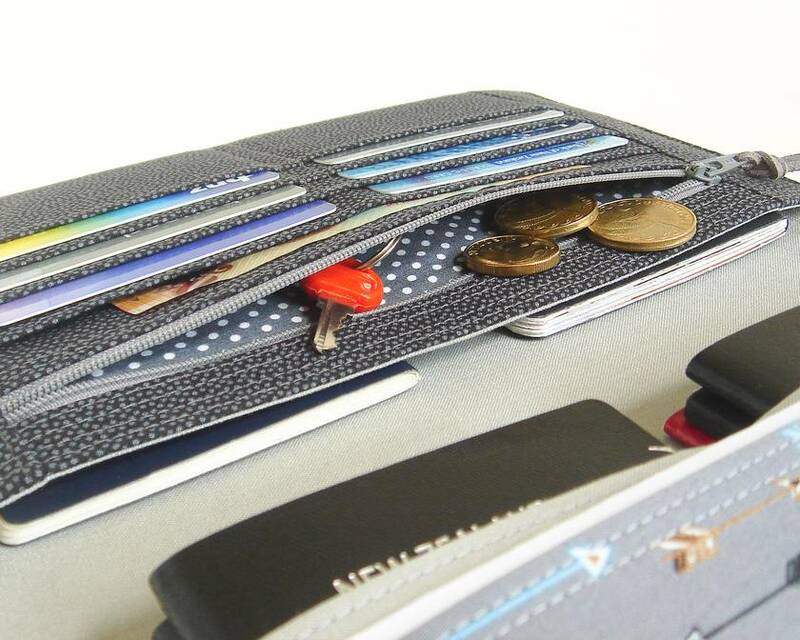 ● Multiple layers of quality imported woven interfacing used in every component of the wallet. ● Imported premium ultra firm stabilizer incorporated to make for a firm travel wallet, giving the travel wallet a leather-like feel. Contact novemberhouse to enquire about payment or shipping options.